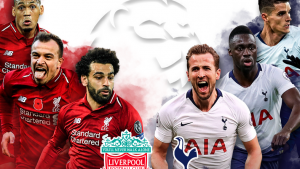 The English Premier League (EPL) match between Liverpool and Tottenham was played at the “Reds” stadium of Anfield yesterday in England which resulted in a 2-1 victory for Liverpool. Going into the match, Liverpool were under serious pressure from Man City (who already won their weekend clash against Fulham) as both teams are locked in a battle of who wins the league at the end of the season. Tottenham on the other hand, have their own pressure tailing them too as they are seriously fighting for a “top 4” survival as Man Utd, Arsenal & Chelsea are all vying for positions inside the “Top 4” as well. All the reasons above made Liverpool VS Tottenham match an all important duel. The game was played yesterday evening and went in a 2-1 Liverpool victory at the last minute, courtesy of a Toby Alderweireld own goal after the ninenty-minute duration got locked at 1-1.